RIO DE JANEIRO, Monday: Sports Minister Dayasiri Jayasekara said that the International Olympic Committee has warned Sri Lanka to amend the country’s sports law on par with the Olympic Charter immediately or face the danger of being expelled from the world governing body. Addressing the Sri Lanka media team here to cover the XXXIst Olympic Games, the minister disclosed that Sri Lanka will soon have to make necessary amendments to the National Sports Law to make sure that it does not clash with the clauses in the International Olympic Charter, accepted by all National Olympic Committees of member countries. “I had a discussion with the IOC officials, along with our NOC officials. They told us that Sri Lanka has been given sufficient time to make the necessary arrangements to accommodate the Olympic Charter in its sport law. We have not done that. We have been dragging this for over six years since 2009,” Minister Jayasekara said. “Sri Lanka has been warned to make the necessary amendments to accept the Olympic Charter or face consequences. If we don’t do that, the IOC will suspend Sri Lanka from the world sporting body. We have to act fast,” he said. “The IOC has said they had to suspend NOCs of India and Kuwait in the past. They will not hesitate to do the same thing to our country as well if we don’t create an environment to accept the Olympic Charter,” the minister said. He also stated that the National Sports Associations (NSAs) which does not function clean and some of the corrupt officials too should be dealt with to clean Sri Lanka sport. He insisted that the NSAs and sports officials must work tirelessly to help sportsmen and sportswomen. 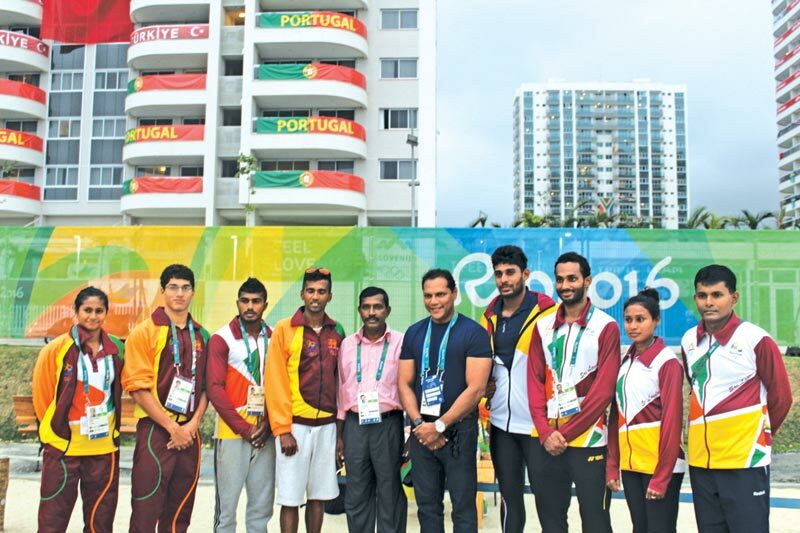 Minister Jayasekera visited the Sri Lanka contingent at the Olympic Village here and personally looked into their needs. The Lankan officials freely expressed their views and problems to the minister who promised to address the issues soon. The minister was accompanied by the Director General of Sports Saman Bandara, Private Secretary to the Minister Sampath Dissanayake and Media Secretary to Sports Ministry Prasanna Adikari. All nine Olympians in the Sri Lanka contingent, along with their coaches and other officials, including Vice President of the NOC of Sri Lanka Deva Henry, attended the meeting.